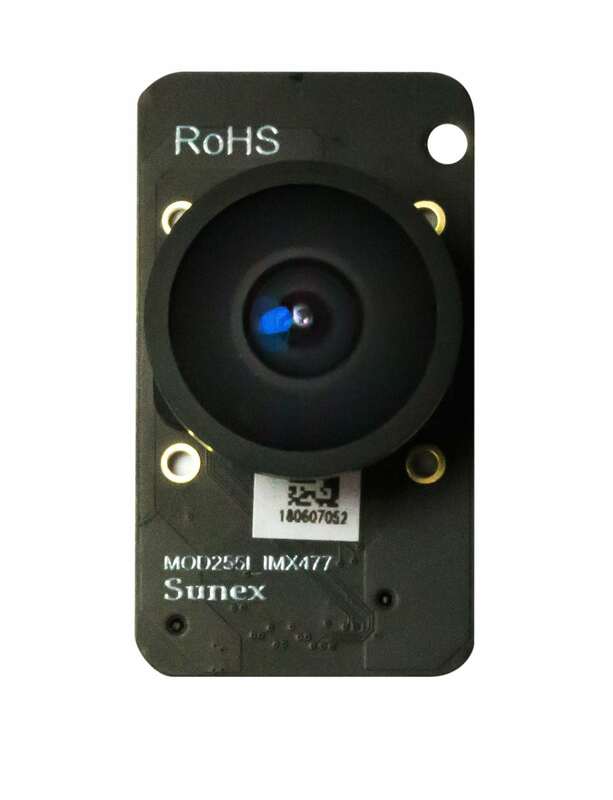 Sunex Optics releases its first sensor module, the MOD255I, based on its 4K Miniature DSL255 SuperFishEye Lens for easy digital video device development with embedded vision. The high-resolution module provides up to 12 Megapixel resolution images and incorporates a Sony 1/2.3 type CMOS image sensor that includes an active pixel array of 4072H x 3062V. The high-performance MOD255I sensor module is the perfect component for manufacturing consumer and security devices capable of continuous video and still images. This MOD255I module and all Sunex lenses are available from global imaging expert FRAMOS®. The MOD255I module is a compact design and can easily be integrated into any embedded vision application. This solution is a perfect fit for security and surveillance, drones, immersive imaging, video communication, IoT, and consumer devices. Sony’s IMX477 CMOS consumer sensor delivers 12 MP at 60 frames per second, or 4K2K video at the same frame rate. The fully integrated and dynamically aligned lens provides a wide 190° field of view at a design image circle of 4.3mm. In addition, it achieves excellent performance in low light with an F/2.0 aperture. The module’s MIPI interface offers 4 bus lanes at 2.1 Gbps for 12-bit digital output with both line scan and frame rate synchronization. The MOD255I module provides excellent electromagnetic interference (EMI) and electromagnetic compatibility (EMC) to minimize interference in truly embedded systems and devices. Consequently, the actively aligned lens included in this module demonstrates improved and uniform image quality. FRAMOS’ mandate is to help existing and new emerging markets and customers in succeeding in the Embedded Vision space through imaging and image processing solutions. With its growing portfolio of modules backed by a dedicated team of industry and product experts, FRAMOS supports the integration of the new modules into their applications and projects and is ensuring that customers receive unparalleled support combined with reliable component sourcing to solve their imaging problems. The goal for FRAMOS is to ensure faster time to market with lower design and production risks for all our customers while maximizing their products’ success. Their profound knowledge of imaging technology is provided together with additional services like development support, customizations, and logistics.